Good writers are made by reading good writing. 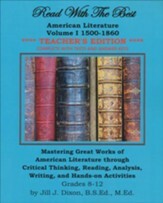 This curriculum features excerpts from works of great literature, as well as fun activities that provide continual practice with proofreading, listening comprehension, genres, and how to tailor your writing to what you're writing. Focusing on actual skills rather than abstract rules, grammar is taught in the context of writing as students follow in the footsteps of literary giants. This is part of a two-book series (Volume 2 sold separately) that's designed to take 18 weeks per volume, with 2 weeks spent per unit. Lessons are organized by day with the number of objectives listed out and brief instructions on what they're to write. Word lists, tips for students with different learning styles, and other helps are included. 106 pages, softcover. Grades 3-12. Good writers are made by reading good writing. This curriculum features excerpts from works of great literature, as well as fun activities that provide continual practice with writing poetry, business letters, taking notes, writing essays, and writing a literary critique. Focusing on actual skills rather than abstract rules, grammar is taught in the context of writing as students follow in the footsteps of literary giants. This is part of a two-book series (Volume 1 sold separately) that's designed to take 18 weeks per volume, with 2 weeks spent per unit. Lessons are organized by day with the number of objectives listed out and brief instructions on what they're to write. Word lists, tips for students with different learning styles, and other helps are included. 139 pages, softcover. Grades 6-12. Help children learn to decode--and remember--vocabulary built from Latin and Greek roots! Start early, and you'll leave enough time for them to have mastered hundreds of vocabulary words in time for higher-level work and tests in high school. With roots for kindergarteners up through high school, start wherever it's appropriate for your children. 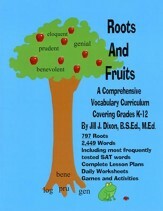 Teaching tips and games are at the beginning, before moving on to alphabetical lists which include the root, the meaning, and a few vocabulary words that use it. 83 pages, softcover. Grades K-12. This new edition includes a number of updates from the old edition! Over 120 new roots (now 797!) are included, over 700 new vocabulary words (now 2449), more highlighted SAT words, 12 new games and activities, and a brand new category of 16 daily worksheets are included. Critical, informed reading doesn't come naturally. 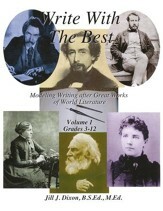 Read with the Best: American Literature features excerpts from works of great American literature along with engaging activities that provide continual practice of critical thinking, reading, literary analysis, and writing skills, teaching students to truly think and thoughtfully engage with what they're reading. "Words to Know" that need to be defined. "Culminating Activities" that are given at the end of the week to help students master lessons. "Writing Assignments" that are given every two weeks and related to literary passages and authors; a research paper is given for the last half of the year. Word lists, tips for students with different learning styles, and other helps are included. 240 pages, softcover. Grades 8-12. This course is designed to take one year.Covers 1500-1860. 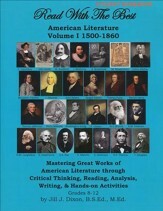 This teacher's guide accompanies the sold-separately Reading with the Best American Literature Volume 1 Student Workbook: 1 500-1860. Student pages are reproduced with the correct answers overlaid, and vocabulary tests with test answer keys are included. Vocab tests are multiple choice.